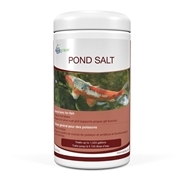 CrystalClear WipeOut is excellent for controlling gill diseases in pond and aquarium fish. 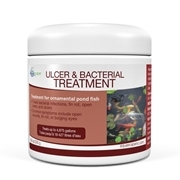 Bacterial diseases generally result from fish stress due to adverse water quality conditions (pH, oxygen or temperature problems), habitat clean-outs, untreated abrasions or predators. WipeOut works extremely well on pond fish species such as koi and goldfish as well as on commonly found aquarium fish species. 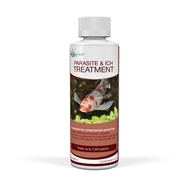 WipeOut is excellent for controlling and preventing bacteria infections such as finrot and ulcers. 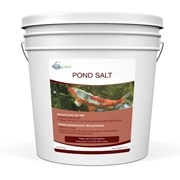 Dissolve 1 oz of WipeOut in dechlorinated water for every 600 gallons of water to be treated and add to the pond or aquarium for a 24 hour period. 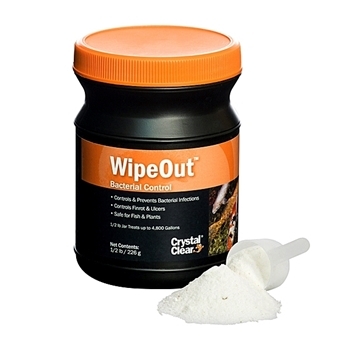 It is advisable to remove filter media prior to treatment for the 24 hour duration of treatment with WipeOut. WipeOut can be reapplied within 36 hours of initial application. Should you want to avoid removing filter media a dip application can be performed in a separate holding tank or "hospital tank", do not reuse container for any other use. Do not over apply WipeOut and follow directions thoroughly for maximum effect. Only use the amount stated above. Overdosing will not increase effect. Do not use other chemicals while treating with this product.